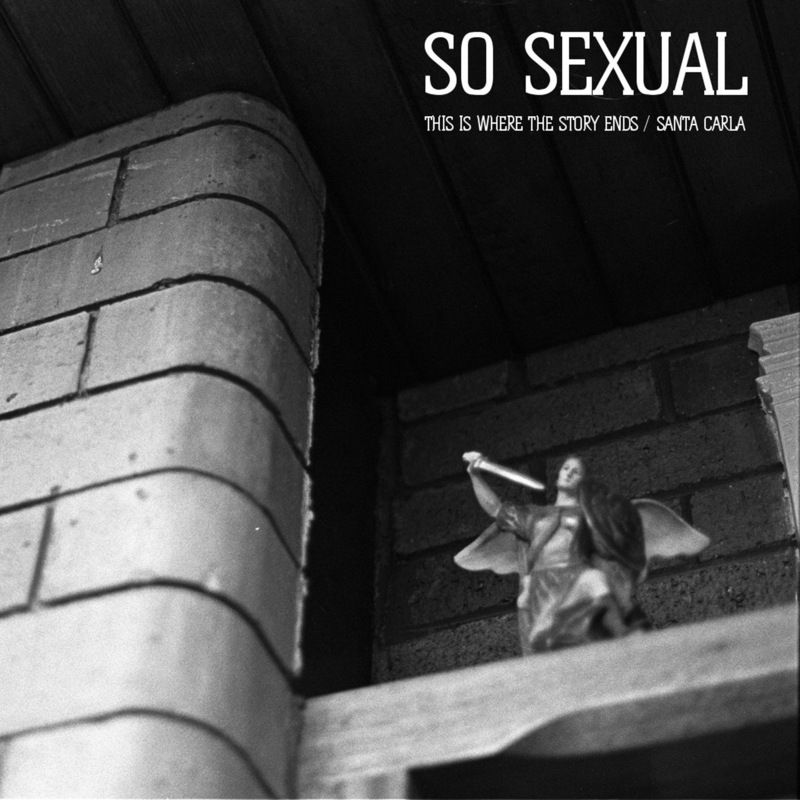 Formed at the beginning 2012 over a few beers in a pub in Liverpool, So Sexual are a post-punk quartet who spent the past 12 months honing their craft and playing live shows, all leading up to the release of their debut single, “This Is Where The Story Ends” with b-side “Santa Carla”. “This Is Where The Story Ends” is textbook synth-driven gothic post-punk ala White Lies. At only 2:49 in duration, it doesn’t waste any time. From the open seconds the template is set and there’s no questions what this band is about. Paired with crooning new-wave vocals, which enter more or less immediately, the sound is a throw back to yesteryear. As dark and gothic as it is, “This Is Where The Story Ends” is also undeniably pop. The emotion reaches height during the bridge, which also features a melodic interplay between 80’s synths and a New Order inspired guitar line. This is one of the catchiest post-punk tracks we’ve heard in some time. Listen with caution – this one is addictive. B-side “Santa Carla” is an even moodier piece than its A-side counterpart. A mid-tempo paced number with brilliant vocal hooks and shimmering synth melodies, “Santa Clara” showcases a hint of slightly more exploratory songwriting with an instrumental section occupying the song’s final 90 seconds. Their music may not exhibit the unconventionality shown by first wave bands such as Artery and Joy Division,who have clearly influenced their sound, instead following a more traditional pop format but when it’s this good and this catchy, you’re happy to put such thoughts aside. It’s a little rough around the edges and some of the playing is a little loose but these “warts” actually add character, authenticity and energy to the music reinforcing that so-called perfection is not always key (especially when it comes to post-punk). A thoroughly enjoyable single and a great start for the band. With baited breath we wait for more. The single “This Is Where The Story Ends” was released on 18 March, 2013 by San Diego label, Bleeding Gold Records (who also recently put out the fantastic Just Handshakes single – read our review). The single is available digitally now via the Bleeding Gold Records Bandcamp.